Billed as “revolutionary,” the DensElement Barrier System from Georgia-Pacific Gypsum integrates an air- and water-resistive barrier within the gypsum core. The system integrates a water- and air-resistive barrier within the gypsum core. The system is comprised of the following components: DensElement Sheathing, PROSOCO R-Guard FastFlash liquid flashing to fill and seal joints, fasteners and other penetrations, and PROSOCO PorousPrep water-based primer to prime exposed gypsum edges. The system is reported to eliminate the need to apply other water or air barriers that cover or coat the entire wall, according to the companies. 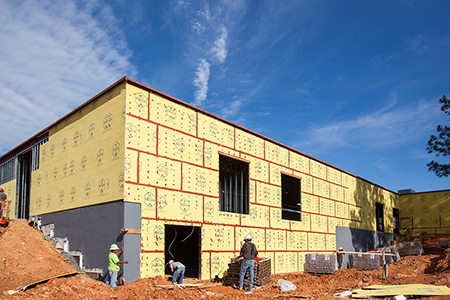 By removing a step in the typical weatherization process for commercial buildings, the system significantly reduces the time it takes to install exterior walls and the water- and air-resistive barrier, ultimately saving time and labor, PROSOCO stated.